Contains one of each: Black, Cyan, Magenta, Yellow cartridges. 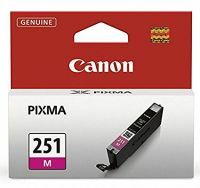 This CLI-251 cartridge combo pack delivers improved color, a wider color gamut and better color fastness. To Recieve updates and possible rewards for Canon CLI-251 BK CMY 4PK please sign in. To Recieve updates and possible rewards for Printer Cartridge, Ink & Toner please sign in.